Back in 2015, Vince Vaughn, Dave Franco, and Tom Wilkinson were featured in a series of parody stock photos to promote their upcoming movie Unfinished Business. The film has a 10% rating on RottenTomatoes.com, so don’t worry if you never saw it. The faux stock photos were the best part anyway. This series of images inserted the three actors’ heads into existing photos, creating a hilarious mockery of the genre. The movie was terrible, but its promotional tactic was a watershed moment for visual content. 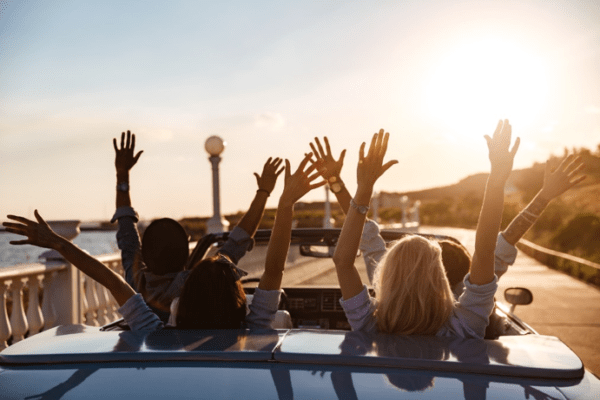 Bland, meaningless stock photography had become so ubiquitous – and so universally disliked – that it could be used as a tongue-in-cheek marketing vehicle. Several years later, marketers fully understand that these kinds of images get about a 10% positive rating from our audiences, but we’re struggling with what to do instead. Now more media have joined the fray, forcing us to curate high-quality audio and video resources along with standard photography. 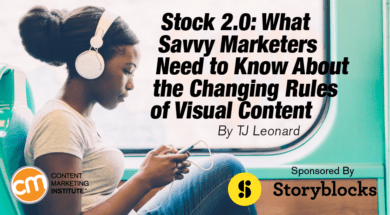 As both CEO of the stock imagery service Storyblocks and a marketer myself, I spend quite a bit of time trying to find the right balance between time, budget, and quality in visual content. Those are really the three pillars of a best-in-class visual content strategy, so let’s dive into each one to see how we can build a meaningful and effective system for making our content look good without breaking the bank. How many of you have found yourself squeaking a blog post in just under the deadline only to realize you’ve forgotten the images? It’s okay, you can raise your hand. I won’t tell anyone. Or maybe you’ve been meaning to start a podcast, but can’t imagine where you’ll find enticing opening and closing music. Or maybe there’s ninety percent of an explainer video sitting on your desktop that just needs some solid B-roll footage, but you just can’t find time to film it. We know we need supporting images in our content, and we don’t need Vince Vaughn’s mocking raised eyebrow to tell us that it has to be professional without being cheesy. But the trouble is we rarely have the time to create those pieces from scratch. This time crunch has created a big market with a strong need, which has mercifully been filled by a new crop of tools designed to give us a sophisticated look without keeping us at our desks till midnight. Intimidated by the video editing process? Magisto is for you. It lets you quickly and painlessly deliver unique videos with the ease of creating a PowerPoint presentation. There are even A/B testing options to help optimize your video’s performance after it’s published. For $10/month you can create videos up to five minutes long and include your own branding. Not a bad way to get in on a format that’s driving over 70% of web traffic right now. Moovly’s claim to fame is animated video, which sounds fancy and complicated but is in fact remarkably simple with this kind of tool. If you need to switch things up from filmed footage, or if real-world video isn’t quite right for your subject, an animated option may be the way to go. Moovly plans start at $49/month. The Canva mission, “Empowering the world to design,” is one that hits home for me. Marketers are often called on to be designers (or we could be far more effective if we were empowered to act like them), so tools like Canva can unlock a whole new world. If you’re new to design, Canva will get you started with templates for social media, blog images, presentations, and even infographics. The basics of Canva are available for free, but to access their templates, stock photos, and magic resizing for all social media channels, you’ll need the $12.95/month Canva for Work option. We use these tools ourselves at Storyblocks, and we’ve also created an API that works with Magisto and Moovly to allow marketers to combine the tools’ functionality with our massive library of images, audio, and video. There’s nothing more frustrating than being forced to interrupt your creative flow to jump in and out of a tool, so we make our content available natively in these (and other) content creation tools. With the right combination of resources and functionality, you can significantly streamline the visual part of your content creation. No more late nights scrolling through Google image searches; now visual content meets you where you’re working. Whether you publish something once per month or once per day, the pace of content marketing is relentless. Even with smart reuse and repurposing strategies, we’re always making something new. And that, of course, means we always need more images. We don’t, unfortunately, always have more budget. Content marketing at any kind of scale makes paying per image extremely expensive; a subscription model is far more cost-effective. An unlimited subscription option makes it less likely that you’ll have to skimp on visuals. If you write a long article that needs six or seven supporting images, for example, you can get what you need without going over your monthly quota for downloads. No matter what you’re marketing or what kind of content you’re using, you’re trying to speak to an audience of real people. Old-school stock photos were technically high quality – they had top-notch resolution and were often set in expensive-looking surroundings – but they didn’t capture real experiences. Modern audiences no longer see these kinds of images as high quality, because their expectations have shifted. Social media now allows them to see everyone, from their teachers to their relatives to their favorite celebrities, in authentic situations, and they expect marketing materials to be similarly realistic. In this environment, cookie-cutter photos featuring perfectly posed and Photoshopped subjects don’t convey a message of quality. Instead, they say that a brand is out of touch with the changing world of their audience. Marketers, therefore, need to work hard to understand the visual world that our audiences like to occupy so we can reflect it in our content. That means social listening isn’t just about reading what people type into their social profiles anymore. It’s also about looking carefully at the images they share. We have to adjust our perception of quality visual content. It’s not about expensive, airbrushed perfection; quality content understands and mirrors back the things that are important to an audience. Where do you see visual content going? Our increasingly diverse, ever more connected world seems poised to keep driving visual content down this more authentic path. While new channels and trends will certainly force us to adapt, it seems safe to say that the days of staged office high fives are coming to an end. What do you think? Has the time of ultra-cheesy stock photos passed, or should we prepare ourselves for their return?